“Take an extra turn” is always alluring text on a card. 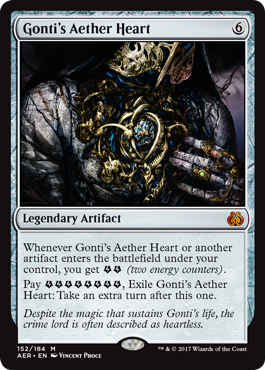 Thankfully, Gonti’s Aether Heart is a bit more than a gimmicky way to act again; it generates energy pretty quickly. The most infamous trick is an infinite combo: with Whirler Virtuoso, Panharmonicon, and Gonti’s Aether Heart, you can generate infinite Thopters, and infinite Thopters can then thop the crap out of your opponent when you take an extra turn (use 3 energy to generate a Thopter; get 2 energy back, which is doubled thanks to Panharmonicon). This is abusable, though the self-exile keeps it from being mega-busted. It really needs to be part of an elaborate combo, though, since 6 mana for 2 energy isn't a great rate of return, and you need time to really get the energy flowing with it. It requires the right set-up to work, though it's a decent contributor in a deck geared for it. I have to confess that I've never been entirely comfortable with the concept of heart surgery. Obviously it saves people's lives, but on the flip side, every culture since the dawn of time has believed that the heart was important. Your thoughts are in your head, but your feelings are in your heart. Do we really know what happens when you mess with it? And what does it mean if you're Gonti and you literally have a machine functioning as your heart? This card seems like an awfully long way to go to get an extra turn, and a major investment of both mana and energy counters. Then again, you'd be paying about the same amount of mana for most of the commonly-used extra-turn cards, and a deck based around energy counters will be looking to generate as many as possible. The thing you'll need to be careful with is spending them on more immediate uses, and/or spending them all on the Aether Heart's effect and then not having much to do on your extra turn. I wouldn't say this is a staple for energy-themed strategies, but it certainly has some potential.